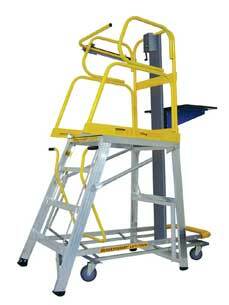 StockMaster Lift-Truk is a safe and easy to use lifting order picking ladder with automatic braking . Items weighing up to 60 kg can be picked, lowered and transported in one action. The whole stock picking process can be safely handled by one person removing the need for a second person to pass items up or down. Featuring a reliable manually operated winch, maintenance costs are minimal, and there is no down time for charging of batteries. Items placed on the lift table can be lowered and moved similar to a fork lift, saving the time to transfer them to a trolley, and reducing the need for trolleys. The dangerous practice of carrying items up or down the ladder is eliminated. A StockMaster Lift-Truk order picking ladder eliminates the dangerous practice of carrying large or heavy items up or down a ladder significantly reducing the risk of accident. Using a simple winding mechanism, the lift table can be positioned to the exact height required to safely transfer items from shelving, and braking of the load is automatic when the winch handle is released. Lift-Truk reduces your exposure to the high cost of lost time injuries and compensation claims. Move up to StockMaster Lift-Truk Pro and you are protected against accidentally stepping off the front of the platform. With the fully automatic StockMaster Auto-Gate your hands are free to carry an item and still maintain a safe grip as you enter or leave the work-space. And with Lift-Truk Pro you also have StockMaster Rota-Gate which provides a gate-way at the side of the platform creating easy access for stock-picking, inspection and many other tasks. A StockMaster Lift-Truk order picking ladder is manufactured from high quality materials and built to last. With reasonable care it will provide many years of service, and cost less than any other product with all of these benefits. StockMaster Lift-Truk Order Pickers . . .
and, costs less than any other product that can deliver all these benefits!